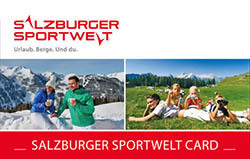 Your receive the Salzburger Sportwelt Card free of charge on arrival at our 3 star Hotel and Gasthof in Altenmarkt-Zauchensee. With this card you are entitle to a variety of reductions and discounts on a wealth of sights & attractions in the region. 190 sights & attractions in the whole of the Salzburger Land are included with the SalzburgerLand Card. In addition there are a number of discounts, e.g. reduced entrance fees in the Mozart City of Salzburg, the Ice Caves etc.